Last Address’s installation of memorial plaques brings us back to real history, to understanding the past and the present, without which the future is impossible. 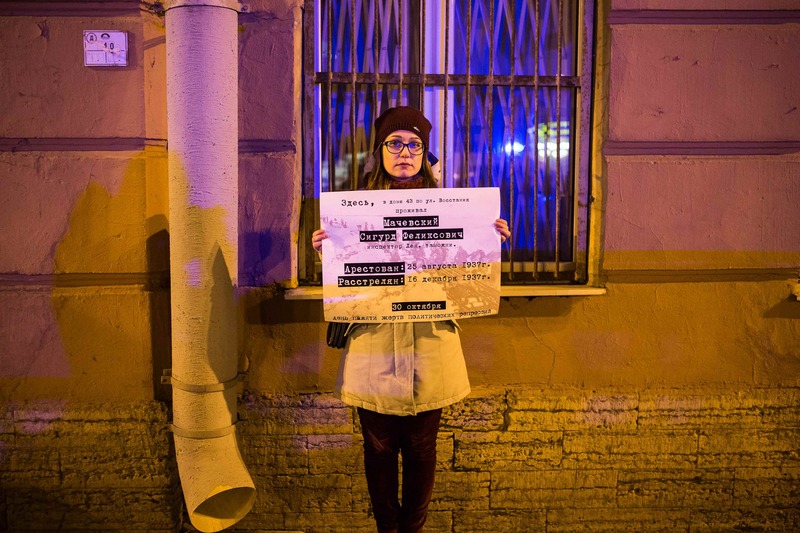 In Petersburg this past weekend, memorial plaques appeared on six more houses, memorializing nine more people and reminding the living about the terrible turns Russian history has taken. It would be no exaggeration to call these people the cream of the crop, the salt of the earth: academics, engineers, artists, teachers, and physicians. Without people like them, no society can survive, but these people do not even have graves. But there are relatives, friends, and kindred spirits whose hearts are moved by the ashes of the innocent victims. 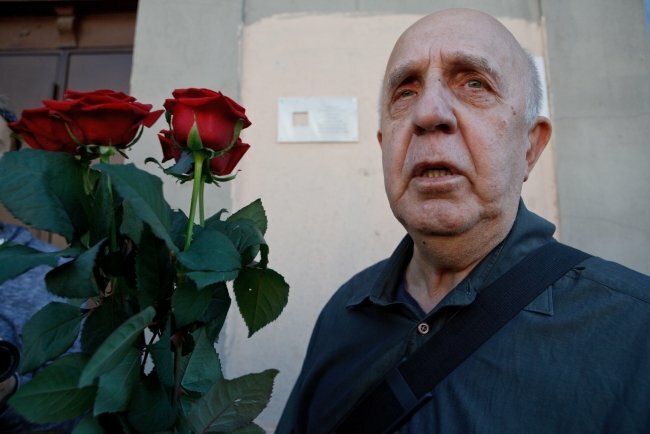 “I am attending my father’s funeral after seventy-eight years,” says a tall elderly man holding a bouquet of red roses and barely hold backing his tears. Then he falls silent, places the flowers on the pavement next to the wall of house No. 1 on Maly Prospect, Petrograd Side, and steps away, covering his face with his hands. When Stanislaw Kozlowski, an engineer at the Plastics Factory, was arrested in the summer of 1937, his son had been born only a month earlier. Two weeks later, his father was shot. His mother’s sister, who took him in, saved little Henryk from life in the camps. 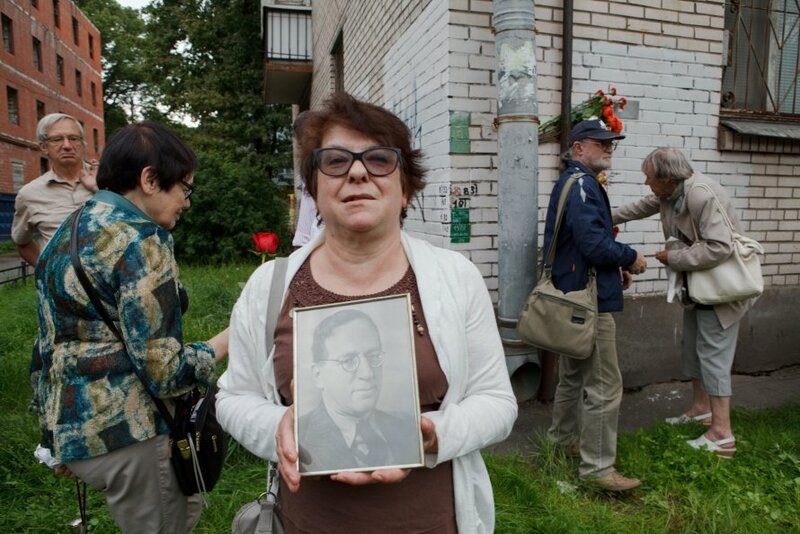 His mother was released only in 1947, followed by the 101st kilometer, a ban on living in Leningrad, and a life in Volkhov, an industrial town 122 kilometers east of Leningrad. During Khrushchev’s Thaw, as former victims of political repression, they were given a room in Leningrad, but by that time Henryk had already graduated from the Polytechnic Institute, and sharing a room with his mother was uncomfortable. He first worked at Krasnoyarsk, Bratsk, and Ust-Ilim hydroelectric stations, then in Syria. Before the war, the well-known Leningrad artist Bronislaw Malachowski had lived in the same building. He was the same Malachowski who conceived and drew Smart Masha, the heroine of very popular children’s comics strip. The prototype of Smart Masha was the artist’s own daughter Katya. Malachowski also modeled Malvina and Buratino, for Alexei Tolstoy’s new book, on his own children, Katya and Dima. On Saturday, the corner house, Maly Prospect, Petrograd Side, 1/3 (at the intersection with Zhdanovka Embankment), looked like a street exhibition on opening day, complete with stands containing photos, original graphic works on easels or simply propped against the wall, and a dense ring of viewers, perusing photos and works that few of them had seen before. In the summer of 1937, when parents and children were vacationing in the Pushkin Hills, Bronislaw was taken, never to be seen again by his family. His wife, Maria, and son and daughter were deported from Leningrad, first to Kazakhstan. Later, they moved to the Perm Region. Soon Malachowski was shot. His descendants never returned to the apartment on the Petrograd Side. 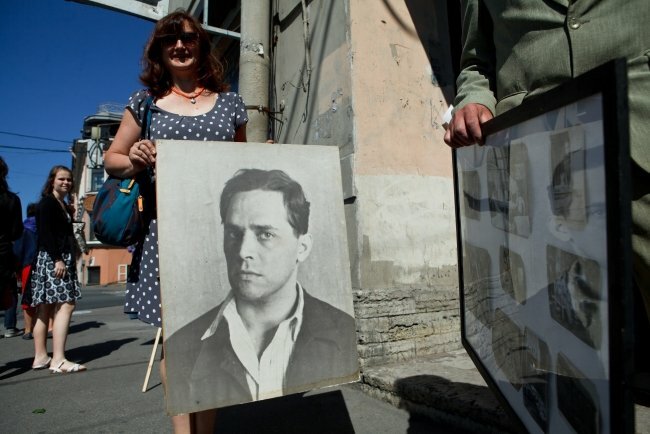 The NKVD confiscated the artist’s entire archive, including his artworks, sketches, and architectural designs. What happened to the archive is still unknown. Maria died in 1948. She was back in prison again for violating passport regulations. The children were adopted by the famous artist Natan Altman and his wife, who was the aunt of the Malachowski children. Katya studied at a ballet school in Moscow, while Dima stayed with the Altmans. A graduate of the geography department, he defended his doctoral dissertation. His son, Vasily, the artist’s grandson, studied at the Leningrad State University geology department. But his daughter Stanislava has followed in her great-grandfather’s footsteps. 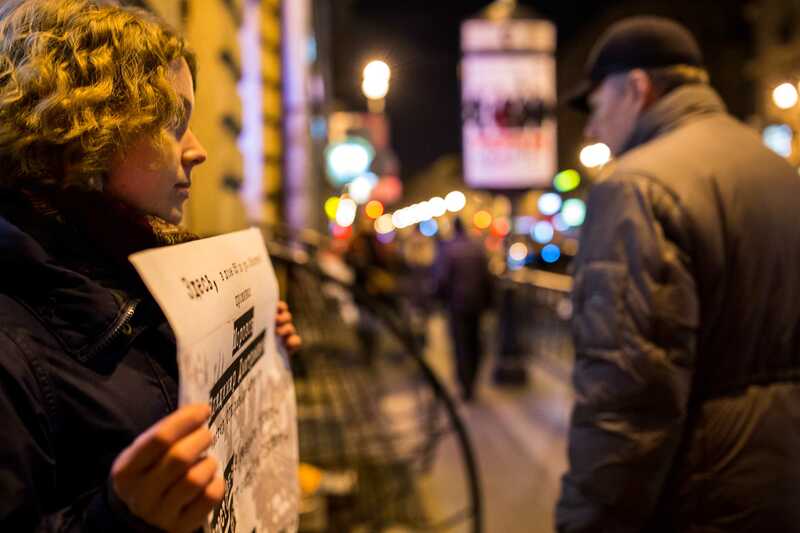 A graduate of the Stieglitz Art and Industry Academy, she has collected a huge amount of material on her family’s history and its Polish roots. Perhaps only a few people now remember the name of Arkady Borodin, a professor of history and law. Scant records of his life have been preserved in the archives of the Library of the Academy of Sciences (BAN), where he worked in his final years, and in the case files of the so-called Academic Affair, a tragic page in the history of Russian scholarship. Between 1929 and 1931, the OGPU fabricated a criminal case against a group of scholars in Leningrad. In 1924, Borodin was dismissed from the university as a hereditary nobleman, and from 1925 to 1929 he was in charge of the alphabetical card catalogue at the BAN. In 1931, Borodin was sentenced to ten years in prison. He served part of his sentence in the Solovki prison camp before being transferred to construction of the White Sea Canal. He died near Medvezhyegorsk in 1932. Borodin’s last address was Bolshaya Pushkarskaya, 1. Now, at the behest of his granddaughter, a memorial plaque has been erected there. 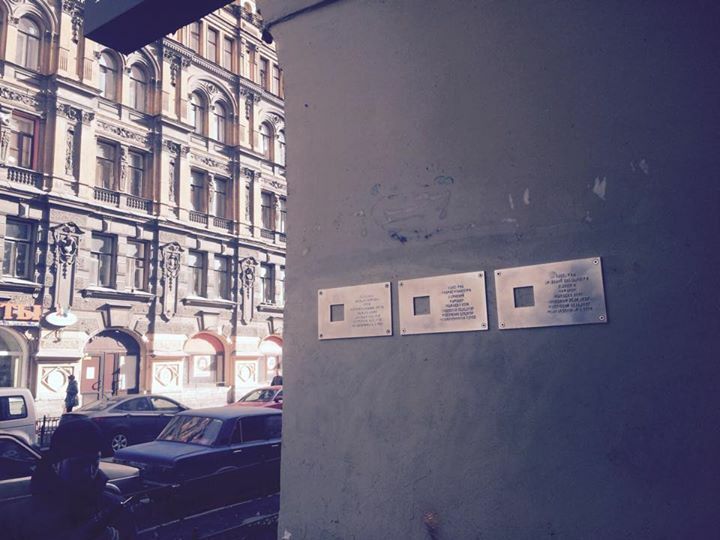 A memorial plaque has also appeared on the 11th Line of Vasilyevsky Island, No. 44, whence the famous mathematician and meteorologist Boris Izvekov set out on his final journey. Case No. 555 is a terrible testimony to the destruction of scientists in Leningrad at the very beginning of the war. This story began in the late 1930s, however. In the mid 1990s, the famous Russian writer Yaroslav Golovanov published an article entitled “Executioners and Victims: Case No. 555” in the magazine Ogonyok. The article discusses NKVD staff informant Yevgeny Merkulov, also known as TV. In the late 1930s, his insinuations led to the arrests and imprisonment of over thirty scientists. 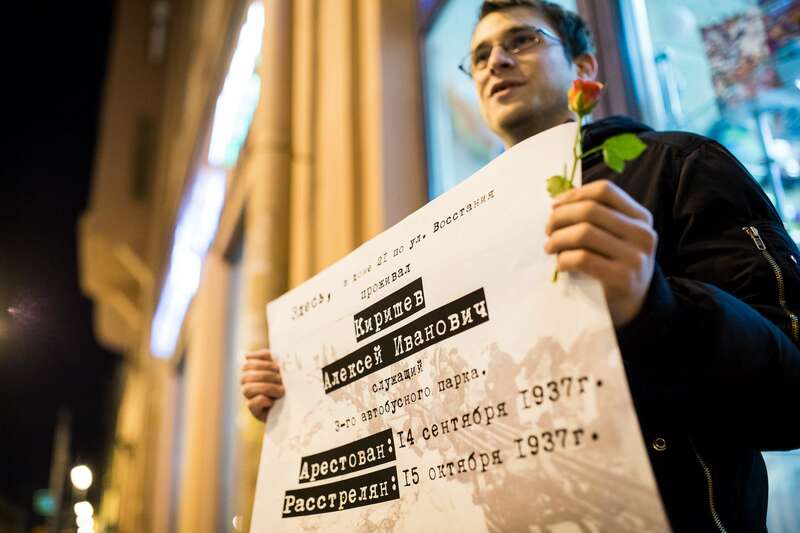 But at the beginning of the war, in late 1941, the Leningrad NKVD launched a massive case against the “counterrevolutionary activity” of corresponding member of the Academy of Sciences Ignatovsky and his “group” in order to prove its need to stay in the rear. Based on TV’s denunciations, between the fall of 1941 and the winter of 1942, over 130 scientists, professors, and lecturers (physicists, mathematicians, and geophysicists) were arrested, shot, tortured, and sent to labor camps. 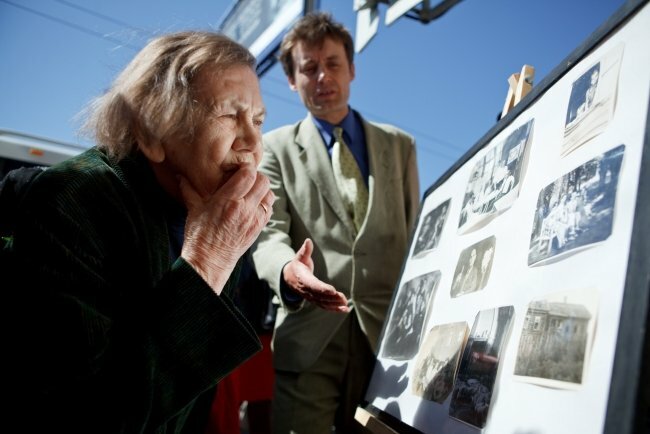 Dolinina and her mother read Gukovsky’s case file in the FSB archives. The telling interrogation reports produced a terrible impression: the interrogation lasted eight hours, but the minutes take up only two pages. Yuri Lotman, Georgy Makogonenko, and Grigory Byaly were Gukovsky’s students. When information spread on the internet that a memorial plaque to Gukovsky would appear on the house that now stands at 13th Line, 56, his relatives began receiving poignant letters. The Belenky-Bogdanov family has preserved the memory of their forebears, who lived at Bolshaya Pushkarskaya, 39, on the Petrograd Side, in the late 1930s. One summer morning in 1937, first the father, Pavel Belenky, a bookkeeper, was taken away from their small room in a communal flat, then the mother, Lydia Bogdanova, a housewife. Their son Vladimir survived. He is is now eighty-five years and lives in Moscow. Because of poor health Vladimir was unable to attend the installation of the commerorative plaque. Instead, his grandson Arseny, great-grandson of the murdered Lydia Bogdanov and Pavel Belenky, came to Petersburg for the ceremony. Almost the entire Dauman family gathered in Petersburg for the first time since 1937 for the installation of a plaque commemorating their forebears. Abram Dauman, who received his education as a surgeon in Germany, operated on the wounded on the front during the First World War. For this he received personal nobility and personal arms, and was awarded the Orders of Saint Stanislaus and Saint George. Learning about the awards, his colleagues commissioned the orders from respected jewelers at their own expense and presented them to Dauman as a token of their profound respect. Ilya Dauman practiced shorthand. He had his own technique on which he wrote a textbook. The Dauman brothers moved to Nekrasov Street, 6, in 1924. The whirlwinds of the revolution had brought them from Harbin. First, the older brother, Abram, was arrested. The younger brother, Ilya, was on a business trip in Yekaterinburg at the time. Descendants of the family live in different Russian cities and different countries. One of them could not make the trip to Petersburg from Brazil. But for all of them this house on Nekrasov Street is one of the most important places on earth. Translated by The Russian Reader. 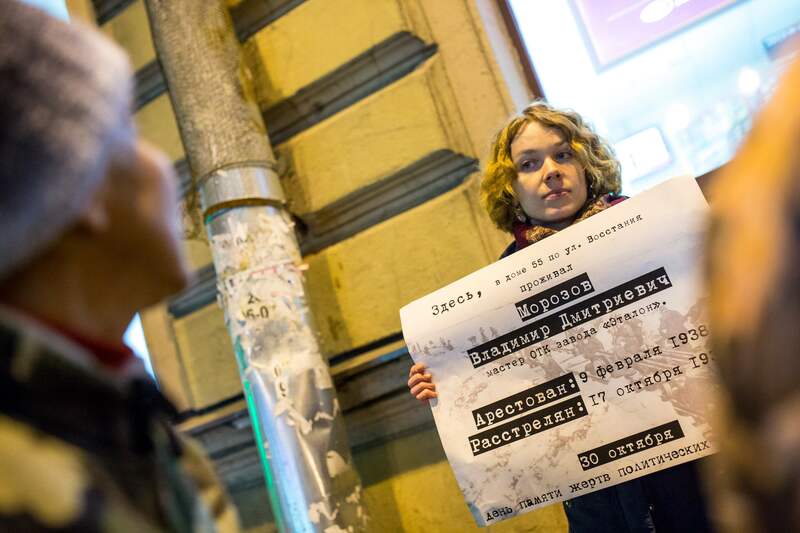 You can read about the Last Address project’s first visit to Petersburg, in the spring of this year, here. Felix Franzevich Baginski was a senior communications engineer services on the Kirov Railroad. He was shot in Leningrad on January 5, 1938, at the age of 33. He was rehabilitated in 1962. Rudolf Petrovich Ruben was an employee of the Urania sewing cooperative. He was shot on January 8, 1938, aged 45, and was rehabilitated in 1989. Anatoly Eleazarovich Gadzevich led a design team at the State Water Transportation Planning and Surveying Institute (Giprovodtrans). He was shot on November 27, 1937, at the age of 41, and was rehabilitated in 1964. They had two things in common. 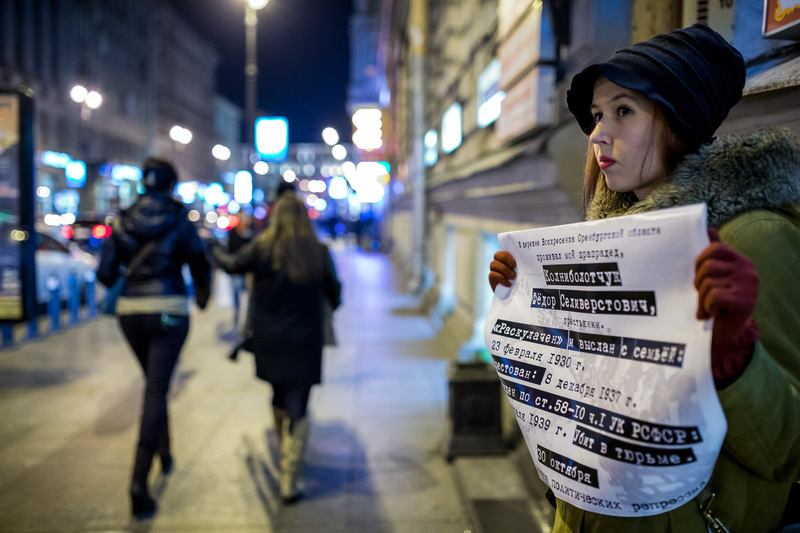 Article 58 [of the RSFSR Criminal Code], under which they were convicted. And house number 19 on Pushkinskaya Street in Leningrad, which was their last address. You can read more about the Last Address project here, here, and here.